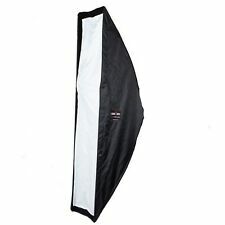 33" Pro Studio Flash Umbrella - Black & White Reflector Brolly. Removable Back. 204 205 206 CTO. Filter Gels are made so that they can withstand high temperatures. Try to keep an air gap between the gel and the bulb/lens. You can use both sides of the gel. 3 X Gel Sheets 24" X 24". Excellent condition, rarely used, used only in studio. Photoflex starlite FV-SL 3200. Condition is Used. Shipped with USPS Priority Mail. Apollo Mega JS 50" Softbox, Umbrella Frame, No Adapter Ring Required - EUC!! It needs no speed ring to attach it to a studio flash head. Simply open it, and slide the shaft into the umbrella receptor on the flash head. 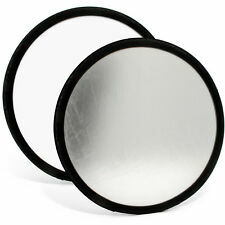 Most softboxes require expensive and heavy adapter rings to properly set up. • Speed ring not included. Bowens Beauty Dish in very good condition. Rotalux speedring. Softbox rods. High quality manufacture of the diffusing and reflecting fabric. The quality of light is outstanding because of their superior construction and the internal diffuser provides the softest and most even light possible. Photo Portrait Studio Lighting Kits; 2 x Light Holder with Softbox Reflector ( SF51F); 2 x 86" Tall High Output Umbrella Flash Strobe Light Stand; Adjustable to Min 53" - Maximum 80"; 2 x 85W CFL 6500K Daylight Balanced Pure White Light Bulb; 1 x Convenient Carry Case; This professional softbox lighting kit is perfect for advertising products, photo-art, industrial, scientific and technical photography, photographic reproduction,photography lighting;. Mikrosat Basic Softbox 40x180 mit Wabengitter. Für möglichst reflexfreie Ausleuchtung ist sie optimal geignet. Nicht nur in Potrait- und Sachfotografie, sondern auch in der Produktfotografie kann dieses Studiozubehör sehr gut eingesetzt werden. Bowens Speedring. Softbox rods. These high-quality and highly efficient soft boxes provide a nearly homogeneous window-light quality of illumination that is perfect for professional portraiture, fashion and product photography. New open box Photo Basics by Westcott 5-in-1 Reflector Kit w/Arm and Stand Photo Basics by Westcott''s 40 5-in-1 Reflector Kit is the fastest, most affordable way to achieve diffused or reflective light. Each kit contains a diffusion panel as well as a reversible slip cover with four sides: silver, gold, white and black. Use it outdoors or add to an existing studio set up for even more versatility and control. Frames are double-riveted to stand up to tough abuse while maintaining its shape and flexibility. Lighttools for Lowel Rifa 44/EX44 Egg Crate Lighting Modifier. Fits both older and newer Rifa 44 models, usually fitting on top of diffuser panel to limit spread of light to a 50 degree angle. Very clean condition, in its bag, no wear and tear. Bundled with black Bowens mount adapter prevents light spill. Product model: Barn Door. The Fresnel 2X features a dual lens design. The rear lens focuses and magnifies the beam onto the larger 6” front Fresnel lens, this achieves zero light waste. The original Aputure Fresnel was an integral part of filmmaking lighting kits. Profoto 1x1,3 RFi Rectangular Softbox in very good condition with normal signs of use. Softbox rods. The larger the light source is in relation to the subject, the softer the light will be. Storage case. NEUTRAL DENSITY FILTER GEL. 3 X Gel Sheets 24" X 24". Filter Gels are made so that they can withstand high temperatures. Try to keep an air gap between the gel and the bulb/lens. You can use both sides of the gel. 201 202 203 CTB. Filter Gels are made so that they can withstand high temperatures. Try to keep an air gap between the gel and the bulb/lens. You can use both sides of the gel. 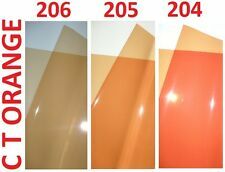 3 X Gel Sheets 21" X 48". Lighting Filter Gels are transparent coloured material mainly used in theatre lighting. Gels are a (paper) thin sheet of polycarbonate/polyester and can be placed infront of lights to give a nice colour effect. The strip shape makes it ideal for head and shoulders portraiture and side light photography. Its larger size makes it ideal for portrait and side lighting photography. 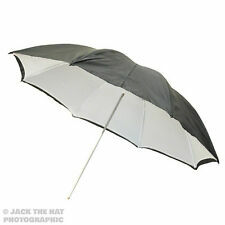 It has an umbrella pop up design making it ideal to use on location and in the studio. Es fehlt der Adapter zum Blitzkopf und die weisse Frontbespannung. Diese ist nur die Haupt-Bespannung mit 5 Stangen und Etui. This in-expensive bracket acts as a mirror bouncing the light back towards the back of the Halo light modifier resulting. This end result is your subject being very evenly light with just a gradual fall off from highlight to shadow. 12° Light Diffusion Honeycomb Grid Aluminum, 1/8" Cell, 7"x7", T=.500"
We provide a wide range of honeycomb products and related services including various cell sizes/densities, widths and lengths, slotting and drilling services, and die cutting. The sheet is 7"L x 7"W. Honeycomb sheet thickness is. 500". GOOD USED CONDITION. CASE IS A BIT WORN. Fabric Only. This item is being sold as-is. We want to be very clear: once it’s sold, it’s sold. ∅ 21 cm ZU NORMAL-REFLEKTOR P 70. Die erstklassigen Broncolor Wabenraster sind aus Erstbesitz und mit Gebrauchsspuren. Die Ausleuchtung ist aufgrund der Form der Wabenraster rund und mittenbetont. ORIGINAL BRONCOLOR. This set of 8 custom cut, high temp gels are made to wrap over top of the bulb of your Godox AD400Pro / Flashpoint Xplor 400Pro Strobe and are held on by a high temp band. These gels allow you to retain full and normal use of all of your modifiers. Rotalux speedring. Softbox rods. The quality of light is outstanding because of their superior construction and the internal diffuser provides the softest and most even light possible. High quality manufacture of the diffusing and reflecting fabric. The Westcott Deflector Plate is designed for use with the Rapid Box. It easily fits into the Rapid Box carry case and is compatible with the Rapid Box Octa, Octa Mini, and Rapid Box Strip softboxes. 1 x Ranger Quadra EL-Reflektor Adapter MKI-II (E26342). Er besitzt einen eigenen, stabilen Neigekopf, damit er am Stativ befestigt werden kann. Schirmhalterung: zentriert, mit Selbstklemmung Ø 7 mm. Rotalux speedring. Softbox rods. 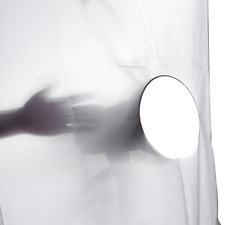 Includes Translucent Deflector, to soften shadows. High quality manufacture of the diffusing and reflecting fabric. The quality of light is outstanding because of their superior construction and the internal diffuser provides the softest and most even light possible. Broncolor Pulsoflex H 80 x 80 Softbox in very good condition with normal signs of use. Special version of the standard Pulsoflex softbox intended to be used with HMI heads. Softbox rods. Front diffuser.